Drinking from the well of life – I Am Not Ashamed Of The Gospel Of Christ! In the gospel of john we learn of Jesus who teaches a woman of samaria how the water she has in a deep well may refresh her,but the water He tells her of is if one drinks it they will never thirst again.This water is as a well of living water springing up unto eternal life! (John 4:11-15). 11 The woman saith unto him, Sir, thou hast nothing to draw with, and the well is deep: from whence then hast thou that living water?12 Art thou greater than our father Jacob, which gave us the well, and drank thereof himself, and his children, and his cattle?13 Jesus answered and said unto her, Whosoever drinketh of this water shall thirst again:14 But whosoever drinketh of the water that I shall give him shall never thirst; but the water that I shall give him shall be in him a well of water springing up into everlasting life.15 The woman saith unto him, Sir, give me this water, that I thirst not, neither come hither to draw. At the last supper Jesus taught the disciples the same message that if any man thirst let him come to Him and drink. 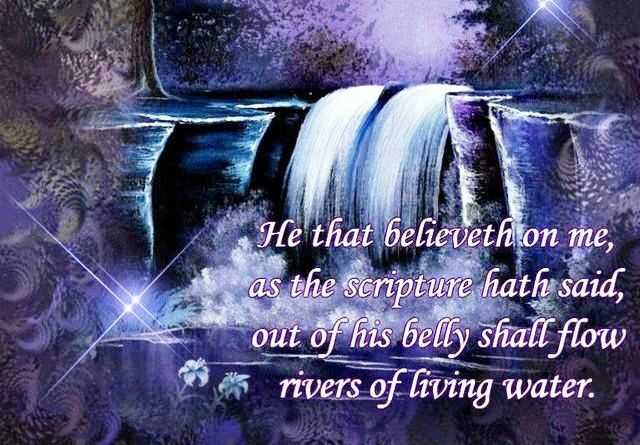 Revelation 22:1-7 And he shewed me a pure river of water of life, clear as crystal, proceeding out of the throne of God and of the Lamb.2 In the midst of the street of it, and on either side of the river, was there the tree of life, which bare twelve manner of fruits, and yielded her fruit every month: and the leaves of the tree were for the healing of the nations.3 And there shall be no more curse: but the throne of God and of the Lamb shall be in it; and his servants shall serve him:4 And they shall see his face; and his name shall be in their foreheads.5 And there shall be no night there; and they need no candle, neither light of the sun; for the Lord God giveth them light: and they shall reign for ever and ever.6 And he said unto me, These sayings are faithful and true: and the Lord God of the holy prophets sent his angel to shew unto his servants the things which must shortly be done.7 Behold, I come quickly: blessed is he that keepeth the sayings of the prophecy of this book. ‹ Walking as Lepers Today ?